“The leaves are about to show us how beautiful it is to let go”. As a society, we invest a lot of energy into teaching people how to strive, grasp and attain. We pay less attention to understanding how to let go. Learning when to hold on and when to let go is a practice that can free us from a great deal of suffering. If we look at what causes us pain (the situations, people or thoughts), we can usually identify clinging in every instance. We have an idea of how life ‘should’ be, and we grip that idea tightly. We grip our idea of happiness, and blind ourselves to the conditions for happiness that are already here. We grip our idea of how someone else should be, and spend years dissatisfied with them. We grip notions about what we’re owed, how the past should have played out. We feel cheated when an imagined future goes up in a puff of smoke – and we can grip that forever. Kierkegaard recognised this when he said, "The most painful state of being is remembering the future". When it suits us, we’re comfortable with life’s constant momentum and change. Adults delight as children grow and develop. As teenagers, we love the idea that we’re going to get older and more independent. But then we reach a point where we no longer welcome change. We want things to stay the same: our bodies, relationships, jobs, even the season of the year. We tighten against the ever-moving life in and around us. We flinch against change, perceiving it as constant loss. The fluidity that we once celebrated is now our enemy. So how can we relax in this ever-changing world? Is it possible to enjoy this moment, even though we know it will not last? Not only is it possible, the awareness that the moment is transitory can make it even more precious. When we look deeply into the impermanence of this creation, we understand that everything is always arising and falling, and that nothing is lost. A wave is born and crests and dies, and all the time that wave is searching to know what water is. By looking deeply into impermanence, we can rest in knowing that there is nowhere to go; nothing to hold tightly. We are already water. When we know this – not in an intellectual way, but feel-know it in our bones, it sets us free. Expanding our awareness wider than our own suffering can also help. Widening our perspective to take in the desires and concerns of people around us; the suffering and joys of animals; the tenacity with which dandelions push up through pavements – all life is striving to thrive. We are part of something so much more expansive than simply us. All we need to do is be with it. It takes energy, to grasp or to resist. In letting go, we release effort. We succumb to this moment, to stillness. We succumb to the peace and calm that is always here, waiting for us. We open to our innate kindness. And, as John O’Donohue says, “the air will be kind / And blushed with beginning." I have three suggested practices below for you. breathing out With this practice, we focus our attention on the out-breath, rather than on our whole breath. We allow our in-breath to arise, and then we choose to be fully awake in our out-breath. As the air releases, we may also sense a release of muscle, tension and effort. releasing This simple practice helps our body notice when we let go. There are many time when we are releasing a weight: putting down a cup of tea; pushing a door handle and then letting go of the pressure; setting down a bag; sitting our physical body down. Let yourself sense the lightening of the load, however small a change it is. Our minds and bodies inter-are: we practice with a mug so that in time, we can practice as effectively with a destructive thought. soak in a poem A few lines of a poem can help to short-circuit our habitual thinking. I often begin my sit with these lines, and when I am walking and notice that I’m a little distracted, I repeat this until I soak into a wider, more awake presence. May we learn to let go with ease and gratitude. I remember one Spring morning, I woke in a low-energy, ‘yeah, whatever’ kind of mood. The day didn’t feel bright; I didn’t feel particularly zingy; my cat wasn’t particularly cute (and believe me, even on an average day, Dylan is cute as a button). I shlumped downstairs, put on coffee – no savouring the rich aroma of the grounds; no anticipatory joy as the machine started gurgling. And then I pulled up the kitchen blind, and life changed. On the windowsill, my sweet pea seeds had sprouted during the night. So teeny, so tenacious, so nearly-fluorescent green. It was impossible not to smile wide at their little miraculous selves. My whole morning changed. In my practice, we talk about every human being born with the same seeds: the seed of joy, fear, kindness, murderous rage. Each of us tends to be born with some seeds that are naturally strong: for some of us, generosity or joy is easily accessible; others may be quick to anger, or to feel the pull of despair - even as a young child. But the thing to remember is that we have charge of the garden. What all the research into neuroplasticity tells us is that where we repeatedly rest our attention becomes a habit and then a trait, which feels like our essential ‘nature’. So the sense of being an anxious person - that feeling of ‘this is just who I am’ - is actually not entirely true. It’s more accurate to say ‘anxiety is a well watered seed in me’. And you can start to cut off its nutrition. Everything needs to be fed to survive. Every seed needs sufficient conditions to germinate: sun, water, nutritious soil – and time. Over time, we come to understand how we are nourishing our seeds. With every thing we take in, we are eating constantly: every text message, document, programme, conversation, song, landscape, game, radio show. Everything in our environment is a source of nutrition: some are superfoods that nourish us, and some are highly toxic. Some leave us suspicious or isolated; others leave us warm and grateful. With mindfulness, we learn to cultivate with care. A few years back, I started checking in on how I felt before I turned on the radio, and how I felt a few minutes later (spoiler: I was never happier for having listened to the radio). With this awareness, we can have more care when we’re at risk. Whether it’s a conversation, a person, a thought or an environment, we know when we’re in a more toxic space and we can protect our sense of solidity and peace. At the same time, we intentionally connect with our wholesome seeds, so that they can gain energy and strength. Those sweet pea seedlings shifted my mood because I'd nourished a sense of wonder for a long time, and so the seed popped up easily. We learn to savour the good stuff, so that when something like anxiety looms, we know that we are more than one emotion. And we can invoke other seeds to take care of us: mindfulness, patience, calm, acceptance, humour. We can conjure an entire garden around that seed of anxiety. It'll revert to its seed-state in time, and meanwhile, we are not alone. You are the gardener. What are you growing? Wishing you patience, wisdom and much joy in cultivating with care. This practice is recognized by mental health practitioners as an anxiety reducer. 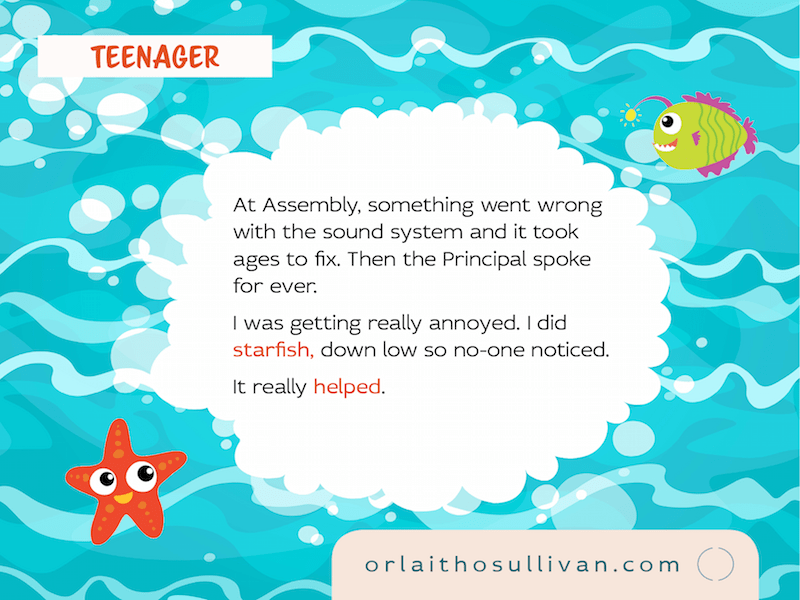 Starfish can help the challenges that we face at any age - whether you’re over-excited about a birthday party, bored in the boardroom, or worried in the middle of the night. It helps us unhook from strong emotions and addictive thinking, and come back to our body in this moment. We offer calm and peace to ourselves, and gain space around a difficult thought or feeling. As you breathe in naturally, trace your in breath carefully up your thumb with your finger. You need to time it so that you’re at the very tip of your thumb when your in-breath becomes an out-breath. Breathe down your thumb for your out-breath, so that you’re at the very base when your out-breath becomes an in-breath. Remember – no messing with your breath! Simply speed up or slow down your tracing finger. Breathe up and down each finger, with care and deliberate focus. Let yourself rest in the sensation of movement – your lungs breathing and your finger moving. As you breathe down your little finger, rest at the base of your wrist for a moment. Check in and see how you’re feeling. Simply notice the feelings – there’s no need to judge or explain anything. You’re just looking. Settling at your wrist, wait for an in-breath and repeat the process, leisurely tracing your breath up and down your fingers, in and out. Pause again at your wrist. How are you feeling? Again, simply notice and label. There’s nothing to fix. You can take time to talk about starfish as a group. Who’s seen a starfish? What colours might they be? How many legs do they have? Does anyone know any interesting facts about starfish? You can listen to each other’s experiences and ideas, and also draw your own starfish. This catalyzes our imagination, and helps us to view nature (and ourselves) with compassion as we learn this exercise. This practice has lots of different names, including 'finger breathing'. When I'm working with teenagers, 'starfish' may sound a little childlike, and I usually call it 'tracking your breath'. You can also do this as 'Mountain', where your outstretched fingers form a mountain range that your finger will climb up and down. It’s nice to imagine our fingers as the petals of a flower, which we trace in all its loveliness. This is a simple, creative, mindfulness practice that we can enjoy to celebrate Mother’s Day. You can do this with family, friends, a class or any group. You can also do it as an exploration on your own, to tap into a sense of care and nourishment. What do we think about when we hear the word ‘mother’? What kinds of thoughts or feelings come up? It might be our own mother (or mothers), maybe a sense of care, making sure you brush your teeth, big hugs, being annoyed when you don’t listen – welcome every sharing. Note: If someone is feeling very negative about their mother, you can guide them to focus on themselves – they get to be here, safe and healthy. That wouldn’t have been possible with out their mother. So that’s something good. We might remember (or imagine) our grandmothers, and great-grandmothers - and further back still. This line of women who nourished our family for hundreds, thousands of years. We know they travelled from other lands – they sailed in dangerous waters, and reached new lands, and were brave and wise and had great days and awful days, and because they lived, we get to live. Amazing! We can explore wider: what about an otter mother, or a squirrel mom, or an eagle ma, or a great blue whale mammy – what do they have in common? Allow ourselves to imagine all these mothers across the world, caring and protecting and feeding and teaching. If we think of a mother as someone who helps us to grow and cares for us, then the Earth is our biggest mother of all. We can explore the homes she provides (house, tent, nest, burrows, an ocean to swim around in), all the tasty food that she grows for us, the beautiful places that she has offered us to enjoy. She is the mother of all of us. And she is kind, patient, wildly creative, and accepts us just as we are. So we can try to take good care of her and live in a way that protects her. (1) Cut out heart shapes (you can do this in advance for ease). (2) Then we decorate our hearts. We can draw pictures or use words to represent someone and something that we love about them. It might be something we love in our mother. It might be saying thank you to a great x 10 grandmother, whose name we don’t even know – thanks for being you so that I can be me. And we might notice that there are other people in our lives who are like mothers - who take care of us and help us grow. So we don’t need to be strict about this. And we can all colour a heart or twenty for the Earth, for the great food and musicians and stories and people and pets that she has brought into our lives. Thanks! (3) We make a display of all our beautiful hearts, and enjoy the offerings of love and gratitude. We can put a hand on our heart to connect deeply with it. We are cared for in so many ways. May we always know how much we are cared for. We can wish our sense of care to travel around the world, finding anyone who is feeling lost or alone. May they be reassured, may they know they are cared for, and feel warm and safe and loved. During exam-time, it's easy for us to undervalue sleep and force ourselves to keep going. When we consider resting versus yet another hour's studying - study feels more productive, more likely to be the most helpful thing to do for the following day's exam. And that may not be true. We shouldn't undervalue the effect that sleep has on our thinking, problem-solving, creativity and resilience. We need sleep to process information, work out problems and lay down memory. When we're malnourished in terms of sleep, our interpretation of the world is (even more) deluded. Worry, distraction, panic - all these are closer to the surface. So whether you're taking exams, or know someone who is, be a sleep advocate! Whether it's a short nap or a full 8 hours, students can nourish body and mind with appropriate rest. Sleep will help them to be energetic, clear-headed, wise, resilient, calm, sane, resourceful - and happy. How can we take care of distraction without getting harsh? The Breathing Jar shows us what happens when we practice mindfulness. Children don't do what you say, they do what you do (most of us learn that the hard way!). Many of us would like to be more mindful at work, but where to start? The moment we notice we’re hooked, we have the chance to do something about it. The question isn’t whether can you afford to incorporate mindfulness, but can you afford not to? Mindfulness is trending, but is it worth the hype?